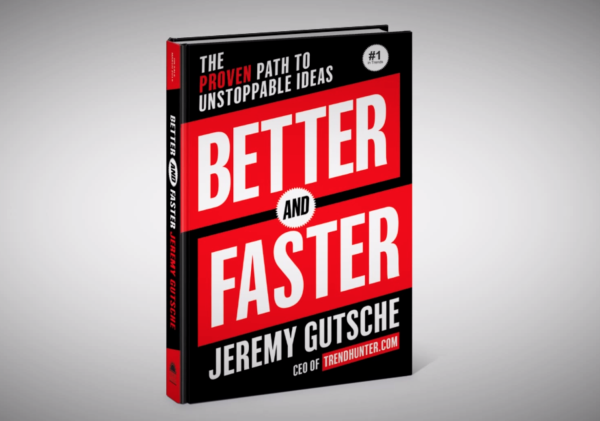 [contextly_auto_sidebar id="o0FnYGG01nYi5nKdS7As5G8DMJTTO9NX"] If your creativity isn't fired up within the first 10 minutes reading Better and Faster by Jeremy Gutsche, you're not paying attention. And if you haven't gotten at least 10 breakthrough ideas by the time you finish the book, you may want to check your pulse. Better and Faster is a lens to identify future opportunities, whether you're a big brand, a scrappy startup or a creative thinker looking for the next big thing. It's loaded with dialed-in insights, actionable processes, and vivid stories and case studies to shake up how you see the future and your place in it. The book took longer than normal for me to read, largely because a story or quote sparked an idea so compelling that I put down the book to whiteboard or call a colleague for a quick brainstorm. For all these reasons and more, Better and Faster is a must-read for big thinkers and action-takers. Gutsche is giving away some preorder specials if you buy Better and Fasterfrom the book's website. By way of disclosure, I worked for Jeremy at Trend Hunter between 2008 and 2012, and received a review copy of Better and Faster. Because of this affiliation, I have an even deeper appreciation of how he and the team have grown Trend Hunter and the brilliance they've compiled in this book.